When you look up “restaurant manager resume”, you are going to see literally thousands of templates scattered on the internet claiming to be “the best”. Sure, it’s incredibly convenient for you, and for a moment it seems as if your $20 paid template would actually land you the job. The problem? About 200 other people have downloaded the exact same template. The chances of anyone changing the template into a more “personalized” version is very, very slim, so you’re bound to end up with competitors with similar resumes. Not that it would benefit you. In this article, we won’t be providing the “perfect template” because there is none. However, we are going to discuss the ways where you could make your own resume perfectly. There’s a reason why resumes are best kept at two pages—it’s because hiring managers take anywhere from 20 to 30 seconds to scan your resume and decide if you’re worth the call. Recruiters receive dozens of resumes each day, so how do you make yours eye-catching in as little as 20 seconds? The answer is in the job description. This is the first thing recruiters look at because they want to understand what tasks you have performed in the past, how you have handled these tasks, and what other skills you may be bringing into the place. They want to see where you’ve worked, your accomplishments, and your level of experience. It’s incredibly crucial to make sure that you boast about what you have done. Were you able to reduce food costs by 2%? Eliminate food waste by 5%? These percentages are better than nothing so make sure to include them. Selling yourself is a good thing, but there is such a thing as overselling. And it doesn’t mean bragging. Sure, you can brag as much as you want, but makes sure to do it in the interview. When writing your resume, you want to capture the magnitude of your contribution or skill well enough that they notice it, but not so much that they know the entire story. Leave something out and make them wonder. Save the big stories for the interview and just provide the highlights of your career. In other words, write your resume with the interview in mind. Say you have managed to reduce food waste by 2% AND costs by 8% by getting in a deal with a local farm-to-table supplier. The only specific thing you should put are the numbers, but leave everything else to the imagination. You can phrase this as “Cut costs down to 8% and food waste to 2% by sealing a suggested business deal with a local B2B”. It doesn’t say anything about the farm-to-table supplier (frankly, no one would care about this detail), but it does speak volumes about your initiative and business skills. And that’s all that matters. Your resume has the spotlight for 10 seconds (30 seconds if you’re lucky). Aside from the job description, the hiring manager will also scan for other details that could pique his or her attention. When writing your resume, do not settle for cliché, abstract, or generic descriptions. If you won an award for employee of the month for resolving a customer crisis that would reduce investments by 30%, you don’t sell that by saying “Successfully dealt with a legal crisis that saved the restaurant”. This isn’t teasing; it’s pretty confusing. Write your resume with a language that is easy to digest and that is easy to process. Any sellable information should be recognizable within 10 seconds of processing that information, or else. You may be using the job experience for educational purposes because you want to be a restaurateur one day; keep it to yourself. You might be an amateur looking for experience before you establish your own business. No matter what happens, don’t include it in your resume. One thing recruiters don’t want to hear is phrases like “I plan on opening my own business one day” or “I’m here because I want to learn from the best”. To you, this is mere flattery; to the recruiters, it’s a giant red flag. Restaurants spend anywhere from $10,000 to $50,000 on training and development. Hearing those phrases tell them that you’re not in it for the long run. “I’m going to open my own restaurant one day” tells them one thing only: “I’m going to learn as much as I can and then bail”. The hospitality industry invests heavily in its employees because they are the face of the business. They are more likely to screen candidates whose resumes reflect loyalty, passion, and dedication to them or to companies they have worked for. When writing your resume, skip phrases like “aspiring restaurateur” to yourself. You can still sell your passion for food and hospitality without making hiring managers feel awkward. Think of your resume as a tasting menu. You might be the best chef in town and even though you want to unload your best dishes to the world, you just can’t. Craft your resume with the same carefulness of a chef deciding on his tasting menu. You might have a dozen achievements, but only include ones that have the most flavor. If you’re an all-around, all-star manager, highlight according to “theme”. If the position you are applying for has specified great people skills, the theme would be administrative—highlight achievements that show your people skills. Streamline each section and sell yourself according to what they’re looking for. Action-packed verbs are all the rage in the resume writing business, so much so that some verbs are becoming more used than others. Even the hospitality industry isn’t safe from these. Verbs like “managed”, “supervised”, “organized”, “communicated”, among the top used verbs in a resume, and it doesn’t really say anything about what you have done. These words come off blasé and reduce your chances for an interview. Instead of going for the first word in your head, check a thesaurus and find a better alternative. Instead of saying “Organized a successful menu launch that permanently increased sales by 10%”, go for something like, “Engineered an influential menu launch that significantly increased sales by 10%”. It’s the exact same story, but the second one sounds so much better because it also uses words that can influence someone’s opinion. You didn’t just “increase sales”, you significantly increased them. Use simple words that would amplify your achievements and make them more powerful. While it can be absolutely tempting to pepper your resume with industry jargon to show your expertise, doing this might actually come off as tacky, and render your application completely unappealing. If there’s such a thing as over bragging, it’s this. When choosing which jargon to use and not use, the rule of thumb is to use keywords that don’t have a strict substitute. These are usually methods and proper nouns in French, Italian, German, or Spanish. Anything else should be revised or scrapped. It’s unfortunate that there are still great restaurant managers who think that the only things that should be included in their resume are strictly managerial stuff. Sure, the rule of thumb is to include relevant experiences, but who said you shouldn’t include beneficial experiences? In reality, not all things that you do as a restaurant manager are related to administration. Let’s face it: restaurant managers go above and beyond in the line of duty. On one busy night, you might have subbed temporarily for the pastry chef who had to attend to an emergency. Maybe you single-handedly replicated the pastries with little background on baking for 3 hours. Maybe you were able to win the restaurant’s lawsuit against fake customer reports. Or maybe you were able to create a food-safe chemical solution that would kill bacteria. None of these have anything to do with the restaurant manager position, but these events do speak volumes about qualities that should be paramount in a restaurant manager. By including achievements, initiatives, and successes that go beyond your job description, you are successfully painting yourself as the ultimate protégé. You are letting hiring managers know that you are more than just a restaurant manager, and that’s why they should hire you. Ditch the templates and write your own resume from the ground up. It is a good idea to turn to the internet for structure and tips, but do not depend on an existing framework to support your skills. Some hiring managers use software to detect copy and pasted templates… not that lazy resumes can’t be spotted with the naked eye. Chronological resume – Emphasis on working experience. Combination resume – Emphasis is on skills and a chronological list of employment. Targeted resume – This kind of resume emphasizes skills specified in the position you’re applying for. Functional – Complete list of skills, training received, and skills used in previous job. 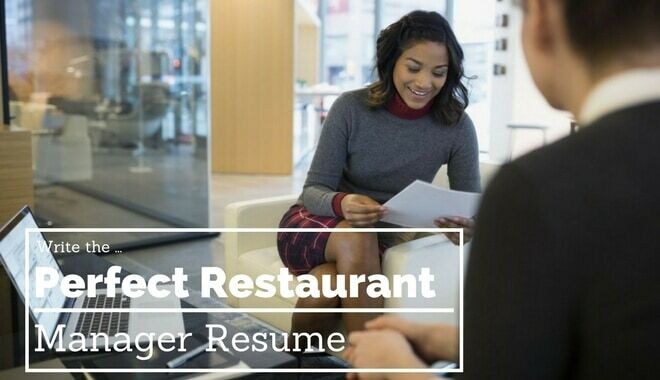 As someone who’s applying for a labor-intensive, time-consuming, and nerve-wracking position, reflecting on your job position, choosing the right words, and arranging your experiences to create your own perfect resume might just be the easiest part of your job as a restaurant manager.